The room was hot and steamy, and about to get salty, at Neighborly Farms of Vermont in Randolph Center. At about 9:30 on a late-summer morning, head cheesemaker Jason Jarvis had already been at work for six hours. It was raw cheddar day. After adding the starter to about 400 pounds of unpasteurized organic milk produced on-site, Jarvis put in the rennet, cut the curds, began continuously testing the pH and drained the whey. He and fellow cheesemaker Clif Cheney formed the cheddar-to-be into cheese “pillows” and milled those into squishy slices. They used plastic shovels to mix salt into the 47 pounds of curds, which they placed in a press to drain further. The next morning, they would have about 40 pounds of cheese, ready to age into mild, sharp and extra-sharp cheddar. While the cheesemaking process at Neighborly Farms is not novel, its business model — based on artisanal-meets-affordable organic cheeses — is unusual in Vermont. Owned by the Dimmick family, Neighborly makes all-organic cheeses that retail for about $12 per pound; typical artisanal organic Vermont cheeses (and some nonorganic ones) run more than $20 per pound. Making that pricing work is up to Linda Dimmick, 54, Neighborly Farms’ cofounder, co-owner and first cheesemaker. 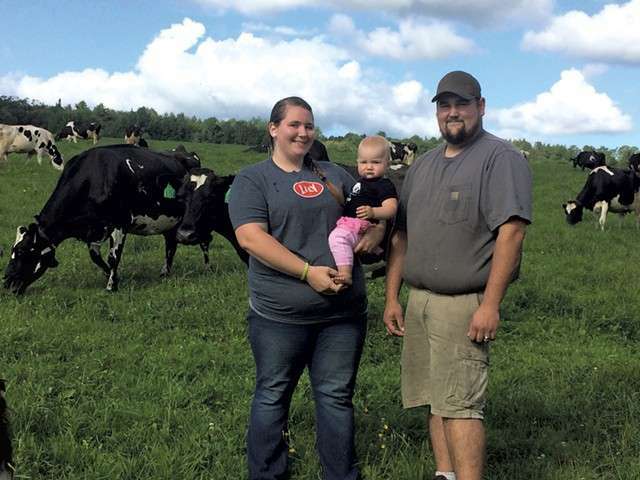 Recently, her son Bobby, 27, and his wife, Brooke, 23, bought the dairy production side of the farm, while Linda and her husband, Rob, continue to own the cheesemaking business. The farm’s history reflects an unusual transition, too. Back in the ’90s, Linda said, organic was not the Dimmicks’ philosophy. When she married into the family, her in-laws, Russell and Sharon Dimmick, ran a conventional dairy farm in Randolph Center called Hillcrest Farms. “When my husband was growing up, the [agricultural] salesmen basically made it sound like you had to use Atrazine to grow corn” for cattle feed, Linda said. Atrazine is a common herbicide that can contaminate surface waters; some studies suggest it is an endocrine disruptor. In ’93, after milk prices dropped to $11 per 100-weight, the Dimmicks sold the herd. “It took us two years to pay off the bills,” Linda said. Five years later, after an unsuccessful stint as beef farmers, they purchased a new herd; in 1999, they made the transition to organic and renamed the business Neighborly Farms. The new methods simplified things, Linda recalled — no more hormone-induced ovulation for the cows, and far fewer visits from the vet. “All we did was give them all organic food, exercise every day and no drugs,” she said. “Now, organic is our philosophy.” When a sick cow needs antibiotics, the Dimmicks treat it and sell it to a conventional dairy farm. About a year ago, Bobby and Brooke Dimmick made a $250,000 investment in what they affectionately call “the Robot,” a high-tech milking machine formally known as the Lely Astronaut. This reporter watched a few cows from the herd of 60 Holsteins and Jerseys head down the pasture to the milking station without being prompted. They were in the mood to be milked, it seemed, and to eat the grain incentives they’d receive during the process. When a cow approached the Robot, the machine recognized her and displayed her data, both on a screen and on an app on the Dimmicks’ phones: stats on her last seven milkings, including production and any teat injuries. Based on such data, the Robot adjusts the amount of grain and supplements, including selenium and apple cider vinegar, that each cow receives. The Robot cleaned the cow’s teats and clamped down on three of them; a dry teat was left alone. She ate her custom blend while getting milked for about six minutes, seeming a little restless only when she ran out of grain. As the cow ambled back to the pasture, the Robot siphoned the milk away and cleaned itself, ready for the next cow. Bobby said each cow averages 2.7 milkings per day and produces 55 pounds of milk. Conventional dairy cows, which often receive hormones to increase their milk production, can average 100 pounds per day. But for the Dimmicks, quality is more important than quantity. “A conventional farmer might make fun of us, but that’s OK,” said Bobby. Because the Robot can milk a cow at any time of day or night without human assistance, Neighborly Farms has no milking schedule. This allows the couple, who are parents of a 1-year-old daughter, to start their workday at about 8 a.m. “That’s what’s rewarding — the flexibility and making our own schedules,” Brooke said. Good cheddars tend to be under-lauded in an haute cheese culture that valorizes richer and rarer kinds of cheese, but Neighborly Farms has carved out its niche by sticking mainly to this staple. The farm also produces cow “feta” and Jack cheeses, but natural-rind cheeses such as Havarti and Gouda require more equipment, including brine tanks, to be produced on a commercial scale. At one point, Linda recalled, she tried producing a clothbound cheddar that was aged at Jasper Hill Farm, but its price point was simply too high for her target market. They have done their own marketing and most of their distribution, although Linda says they plan to work with distributors soon. Another way she economizes is by designing her own packaging, which appears to be straight out of 1999 and does little to challenge the homey reputation of cheddar. For families such as the Dimmicks, dairy farming and cheesemaking remain a tricky dance of not going broke, Linda suggested. While she’d like to devote 100 percent of the farm’s milk to cheese production, the Dimmicks make ends meet by selling half of their milk to a stable buyer: Stonyfield, which pays them $37.50 per 100-weight. From about half a million pounds of milk, the cheesemakers produce 50,000 to 65,000 pounds of cheese annually. Yet another diversification strategy is producing flavored cheddar. While bad memories of oversmoked cheddars may turn consumers away from such products, Neighborly Farms’ green onion cheddar — flavored solely with organic green onions — deserves a chance. One evening, I ate it with crackers, tomato jam and wine. The scent of the onions was warm and savory, and the cheese’s texture was pleasantly squeaky — true comfort food. “This smells like my midwestern childhood,” my companion happily mused. 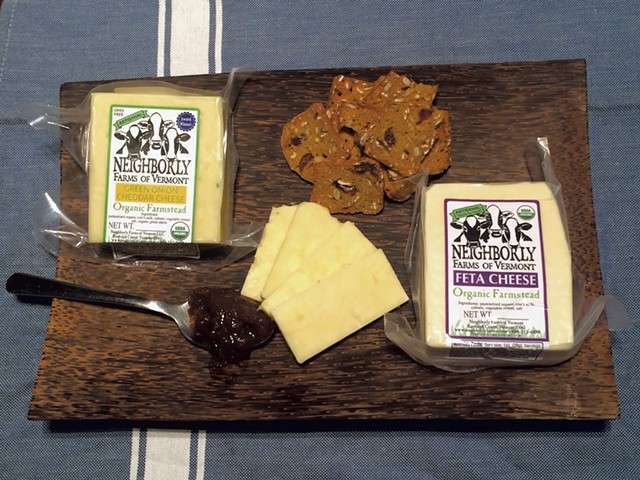 Satisfying when melted on a Spanish-style tortilla for at-home brunches and friendly to gourmets with diminished grocery funds, Neighborly Farms’ cheddar is an adaptable workhorse of cheese in a case of show horses. It’s a neighborly pleasure, indeed.